Looks like nice Christmas Wrapping Paper?? Many teams of researchers all over the world are working on the development of organic solar cells. The Fraunhofer Institute for Solar Energy Systems presented some new ideas which will speed developments at the world’s largest trade fair for nanotechnology, the nano-tech 2008 Tokyo on last February 13th to 15th. Organic solar cells can be printed (like a newspaper) onto very thin and cheap plastic sheets, which makes them inexpensive to manufacture. Organic solar cells are not intended just yet to compete with classic silicon cells because they are not efficient enough - but that will probably change with newer developments. Until now, the front electrode that faces the sun, has been made of expensive indium tin oxide because this material is transparent. 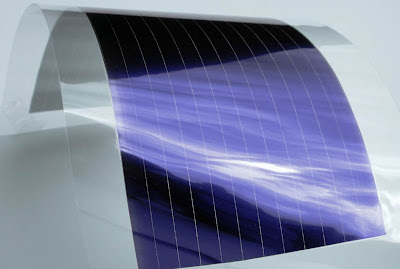 But now there is an alternative: The Fraunhofer crew has interconnected a poorly conductive transparent polymer electrode with a highly conductive metal layer on the rear side of the solar cell. This connection is done trough numerous tiny holes in the solar cell. This has the advantage that allows a low-priced material to be used. I am always facinated by developments in nano technology and especially with regard to Solar Cells. I look forward to reading the various announcements of new discoveries and developments as they happen - and they are happening at a faster and faster rate. I have no doubt that thin film PV cell will become highly efficient and really cheap in the coming years.